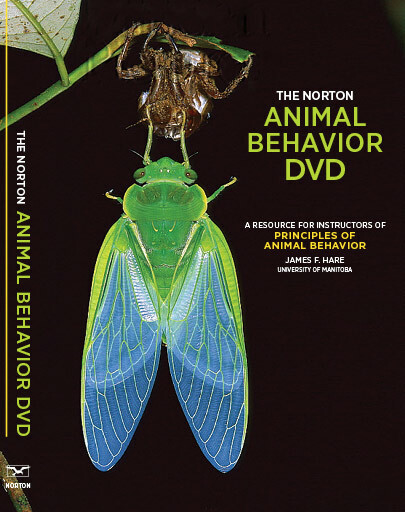 The videos here represent a selection from the Norton Animal Behavior DVD as well as many new clips recently donated for use exclusively on the student website. Each clip includes a brief description of the behavior observed in the footage, as well as references to relevant reading in the science journals, articles, and textbooks. Each video also has up to five multiple-choice quizzes aimed at testing students' mastery of core concepts and their ability to analyze examples of animal behavior. Select a topic to begin! More information on this DVD. A harvestman (order Opiliones) is swarmed by army ants (Eciton burchellii), but as with several other arachnids and some insects, it remains motionless, thereby escaping unscathed. Eciton army ants rely almost exclusively on vibrational and chemical cues to detect prey, and they refrain from biting or stinging inanimate objects. Because additional workers are recruited only to subdue active prey items, the foraging swarm of ants eventually passes, leaving the surviving harvestman in their wake. See Topic 1: Principles of Animal Behavior for a longer description of this clip, and for more videos.